The training and diet plan that helped Amy LeRoy lose 120 lbs in 10 months! She was morbidly obese and she had to be treated for high blood pressure and anxiety throughout her school years. She realized that she needed to change her lifestyle when her brother would not allow her to ride in his car because she couldn't fasten the seatbelts. At that time her weight was 350 pounds. Amy decided to undergo slimming surgery in 2006. She followed a low-carb diet before she had a lap band put in and she lost about 30 pounds with it. Her slimming process stopped when she stopped going to her doctors. She had the band removed in August 2015 as it caused her pain. 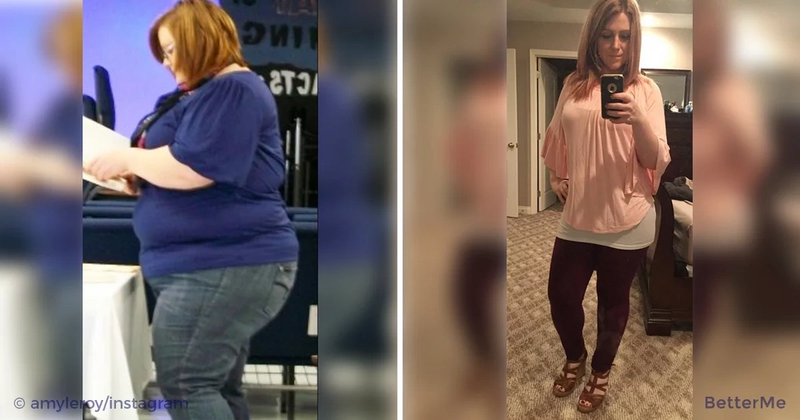 Her starting point was April 2nd 2014, this was the first time that Amy decided to change her life without the help of any easy fixes. She really started to work for this! Now her weight is 200 pounds and she's not going to stop there. In this article, we will show you how Amy achieved these excellent results in just 10 months. You can also use her diet and training plan in your slimming process! READ MORE: What does your sitting position says about your personality? She loves to prepare something with spaghetti squash or zucchini. Her favorite dishes are meatballs made from turkey meat with spaghetti squash or zucchini stuffed with turkey meat, vegetables, and cheese. She loves to mix different healthy foods to get an interesting taste. Amy does not like monotony. Now this strong and ambitious woman feels great. She has started training at the gym in order to keep her body in a good shape. Amy is happy that she was able to change her lifestyle and now she is ready to inspire others in their weight loss changes.